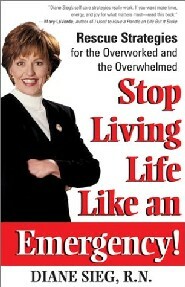 Diane Sieg works with people who want to stop living their lives like an emergency! Emergency Living is full of panic, chaos and crisis care-taking. It keeps us moving at warp speed, multi-tasking and always thinking about the next thing. Emergency Living prevents us from paying attention to what is really important, the here and now. It keeps us busy, it keeps us frantic, it keeps us tired. Finding Your Voice in Work, Love and Money! You were received with great enthusiasm by our staff for your creativity, motivation, humor, and your great compassion for the participants. I heard many say they could have stayed all day listening to your insightful knowledge and ideas. The response to your program was overwhelmingly positive. You were funny, engaging and able to relate to the group and their needs. Thank you for your dynamic presentation. Your message was perfect for our group as we all seem to have such busy lives with overextended schedules. You gave us the permission and the skills to help us slow down and take care of ourselves. The comments from the evaluations speak for themselves. Your expertise and dedication to our organization is highly respected and appreciated. Each year we strive to bring more educational value to our members; this year was no exception. Thank you for sharing your knowledge and expertise with its members.